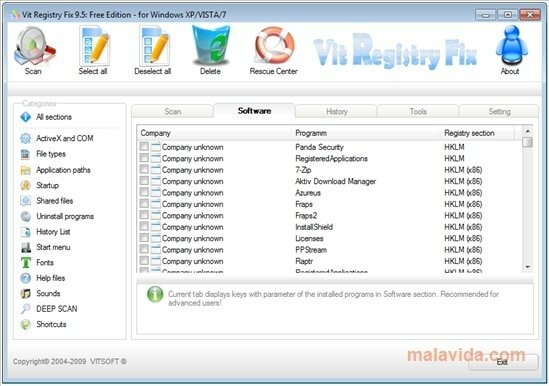 Vit Registry Fix is an application designed for the cleaning of the system registry with which any user, whether an expert or a beginner, will be able to detect their errors and eliminate them. The Windows registry is a file system that stores both the options as well as the configurations of the operating system, of the programs and the hardware. As time goes by, it grows in size and the amount of obsolete and invalid entries increases. Due to this, it comes in very handy to have an application like Vit Registry Fix, which is practical and easy to use. - Automatically fix the errors. - Eliminate unnecessary temporary files. - Manage the list of programs that are launched together with the system start up. - Create a backup before eliminating the errors as a precaution in case of possible errors. Keep you system registry in full shape thanks to Vit Registry Fix.